To help bookstores promote Banned Books Week, September 24–30, the American Booksellers Association is distributing a promotional kit in the August Red Box to the most active IndieBound stores as well as to stores that received the kit last year. Booksellers can also request the kit by filling out this form. There are just a few kits remaining, so booksellers should make their request now. The kit, which was created several years ago by American Booksellers for Free Expression and Ingram Content Group, includes 25 feet of “caution” tape; 100 bookmarks for consumer giveaways, featuring four of the most frequently challenged books in 2016; “I Read Banned Books” stickers; an easel-back display; and a pamphlet produced by the American Library Association that describes the titles banned and challenged in 2016. 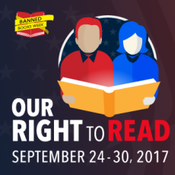 This year’s Banned Books Week will celebrate the importance of the freedom to read for all Americans. From August 31 to October 5, Ingram is offering an additional discount on initial orders of 25 or more books from a list of more than 450 banned and challenged titles on ipage®, Ingram’s search and order content platform, as well as on subsequent orders placed during that time. For more information about the discount, stores should contact their Ingram sales representative; call Ingram Customer Care at (800) 937-8200; or e-mail orders@ingrambook.com. For the latest developments, visit the Banned Books Week website. Information is also available on the Banned Books Week Facebook and Twitter pages.